This sharp turn on Riverside is a little more than a mile west of Oakville Road. There are more crashes on Riverside than on any other Linn County road, says Chuck Knoll, the county engineer in the Road Department. Safety improvements have been contemplated since the 1990s. Now, after a lengthy period of planning, acquiring strips of property, and getting state and federal permits for items such as wetlands and archaeological resources, the county is ready to call for bids next Friday on Phase I of the project to widen and repave Riverside from Oakville Road, just outside the Albany city limits, to Meadow Road, about 2.4 miles way. Then, the county expects to open bids toward the end of August and hopes construction can start by mid-September. The road will be widened to at least 32 feet across. With two 12-foot travel lanes, that leaves a minimum 4-foot shoulder on both sides. Four feet may not sound like much, but it will be twice, and in some places more than twice, the space available to bicyclists now. This will be helpful to bike riders using Riverside and the separate path alongside Highway 34 to travel between Albany and Corvallis. While wider paved shoulders won’t protect cyclists from the possibility of being slammed by drivers crossing the fog line, they should make riders feel a little safer by providing more space. 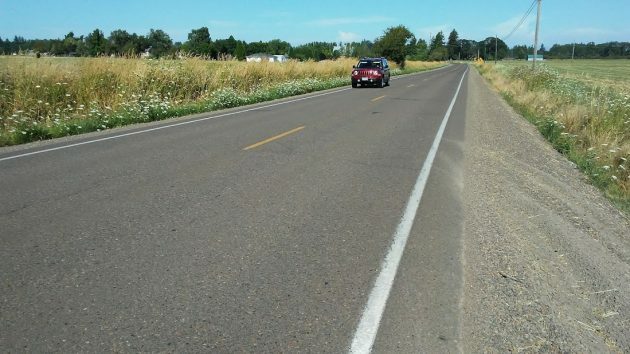 Linn County’s widening of Riverside was a key point in the justification for ODOT’s $1 million bikeway from Corvallis to Riverside along Highway 34, completed in late 2015. The 34/Riverside link is one alternative to the Albany-Corvallis bikeway in the Highway 20 corridor, which Benton County is still trying to build. Parts of Riverside, like this one, have very narrow paved shoulders. Mr Hering. I respectfully take exception to your report of Riverside Drive being so dangerous. It’s not the road, Sir, it’s the insane car drivers and the bicycle riders who do not obey the rules of the road as stated in the Oregon Driver’s Manual. The only accidents out here are people to do not obey the speed limits and do otherwise irresponsible things. I thought we went through this years ago at a meeting with the County Commissioners. It is my understanding that from that meeting Riverside Drive had been declared an Oregon Heritage site and could not be “improved”. I find this action unnecessary and feel very abused by being railroaded. If the road is not dangerous as you just stated. Of the road need to be followed. So leave it alone…. I tend to agree with Ms. Johnson. Much of the traffic on Riverside exceeds the speed limit, in part due to the commonly held view that one can travel 10 miles over the posted limit without getting a ticket. Widening the road and smoothing out the sharp curves will encourage more drivers to push the limit. For a road with the highest incidence of traffic accidents why is there not a high level of police speed patrols? As for the “Heritage Site”, many years ago the county was planning to “fix” Deadman’s Curve, by the Orleans chapel and cemetery. As I have been told, Mae Yih stepped in to the controversy and stated Riverside was a territorial road and could not be changed. Thus the curve has remained. No one has been able to contact Ms. Yih to verify this statement. Perhaps Mr. Hering would/could? I believe that speed limits do almost nothing to slow traffic down to a safer level. Rather, wide and straight lanes with no geometric “traffic calming” features will be driven fast by most people. 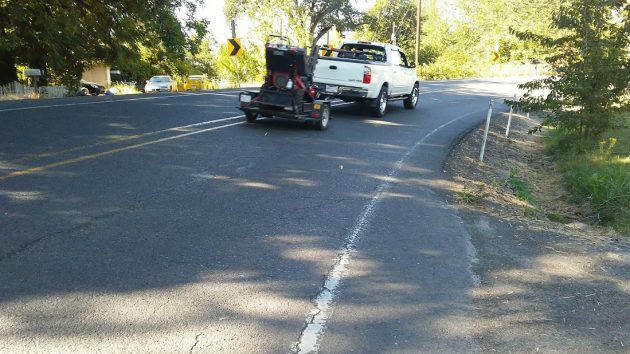 If we are willing to widen this stretch of road to accommodate a bicycle lane, then we motorized vehicle operators will have lost some of the most pristine No Bike Lane stretches in all of Oregon. As conditions now stand, high-powered motor cars can pretty much do as they please. Few sounds are as rewarding as that of a grand American V-8. But, put in a bike lane and now you got your politically-correct human-powered snobs and shoots who would love nothing more than to see your V-8 Muscle confiscated and summarily crushed. With Jeff Sessions’ recent support for illegal seizure of assets, one can see how quickly the bicyclists will become strange bedfellows with newly-minted Albany PD “Bicycle Support Unit,” whose mission is to kowtow to the base desires of the bicycle cult. Who said comments on this site have to make sense? I think a lot of people forget that bicyclists are also motorists too. I happen to have “grand American V-8” car, that I enjoy driving as much as I like riding my bike. I think both are equally valid modes of transportation, and both can occupy a road without issues, if we all just try having a little respect for one another. That’s what is missing in society today, people just trying to understand other people opinions, even if they don’t share them. A little respect goes a long way. The only problem I observed last time I drove some ‘merican muscle down that road which was approx. a month ago was the numerous tRump for pResident signs STILL displayed on properties. Maybe they are down now. The other side was too embarrassed to leave their signs up. Bill Kapaun, you made me chuckle! My sentiments exactly!